This is the “blogging” result of what originally was a presentation I gave about the need of re-fuelling in a long run like a Marathon and the role played by “gels” on it. That explains the appearance of the photos. It is quite common that after successfully completing several Half Marathons and “mastering” the distance and the training, a runner decides to step up and try for the Full Marathon. But, in the process of increasing the training load, things do not work the same. The thinking “It is just double the distance, so I will do double the training” does not work, the runner gets too tired in the long runs and eventually “hits the wall” as they say. One of the explanations is the “Fuelling system” of the body and the need of “Re-fuelling”. But first, let me clarify that what you will find in the following lines is a simple explanation of the basic concepts involved, why you need to eat during the Marathon and a proposal of how to do it. This is not a scientific paper, and the graphics are just to illustrate the concepts: there are no formulas/calculations behind their shape and proportions and for each person the numbers can be different. Each runner needs to experiment a bit, try different things and find out what and when things work for him/her. So, let’s go !! The body uses two basic sources of Energy, FAT and CARBS. The body is continuously burning both of them to cope with the energy requirements. So, we can represent (see the photo) our storage of CARBS and FAT as a column shape and the “Fuelling Box” in between: it represents how much of each one of them we are consuming. If we are watching TV: the size of the Box will be very small… if we are running: the size will be bigger: we need more energy !! easy to understand, right? Now, what is the difference between burning FAT and CARBS? The FAT produces much more energy than the CARBS (they say… right now… you have within your body enough Fat for 2 marathons!! ), but it is more difficult to burn it: it takes more time. So, if there is a quicker demand of energy, the body will tend to consume more Carbs. Just think: how long do you think you can be walking continuously? And running?… The difference is that while walking, the body has time to burn Fat and can cope with it for longer time, whereas while running it will have to rely more on Carbs, and the energy coming from them is more limited. Similarly, if you run faster, you will be more in the Carbs zone. Can we increase the amount of Fat we burn by running? Of course, we can !! But that requires training, and training at slow pace…. The more you train, the more you will be in the “Fat Zone”, and the longer you can go. But “training” is not the subject of this blog. When we run a Half Marathon, our “Fuelling Box” is somewhere there, in between. We start running and consume our resources. It will depend on each person: on the intensity of the run, on the fuelling of previous days, on tiredness, on the training… many factors play a role, but for most of the cases, the energy resources will not be a problem: they will not be finished. We can say that we have enough within us for a Half Marathon. The kind of CARBS provided by GELS will be beneficiary and they will help in your performance, but they are not essential. But, what about the Full Marathon? That is another story, because it is the other way around: we do not have enough resources to finish it!! There will be a moment when we do not have enough CARBS to keep the supply of energy, as per our graphics: there will be a moment when our “Fuelling Box” will touch the ground !! And we will be forced to stop: to consume less CARBS, i.e. : to walk !!! As we said before, FAT won’t be a problem, we have enough. What we need is more CARBS, and here it is where the “re-fuelling” plays its crucial role. If early in the race we take some gels or similar nutrition, we will increase the storage of CARBS so that our “Fuelling Box” will never touch the ground, and we will be able to keep the pace. Food takes some time to go from the Stomach to the muscles (to be available for Energy), so we cannot start re-fuelling when we are tired. We have to do it gradually, starting early. The most standard practice is that 3 to 4 Gels will take you through the race. And the best is to take them at similar intervals, if 3 then: take them at km 10, 20 and 30. Remember that they should be taken with plain water, since their formula is concentrated: to give you more energy in less space. Can other products serve the propose? Of course!! Gels are a selection of good and easy to digest CARBS, so that they can reach the muscle faster. However, any other source of CARBS can be used: energy bars, bananas, dates, etc… Just remember to distribute their intake homogenously during the race: the stomach needs its time, so better not put it under too much pressure. DISCLAIMER: The event where I gave this presentation was sponsored by Unived and theirs Gels and other products were introduced to the participants, like the series RRUNN (for more details: www.unived.com). These are the products I use and I can vouch for them. However, I do not have any kind of Association or Interest in the company (besides having a good relation with them). 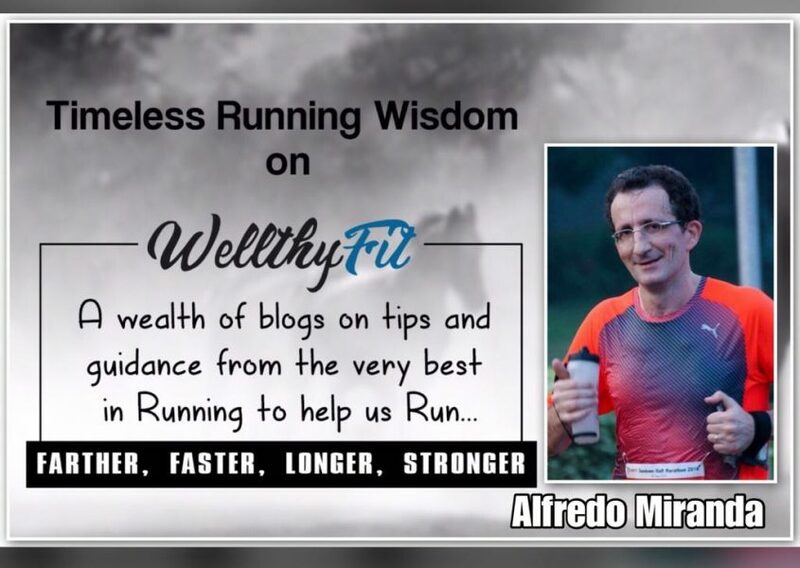 Warmly known as Alfie by runners in the NCR Region, Alfredo is a mentor and a guide, par excellence, to many fledgling and mature runners. A super marathoner himself, he helps runners with their running plans for various events and most importantly always keeps their morale high up! why these Gels are addictive like drugs ? with out gels human can do many things ….but dont know why people looking for short cuts in life and becoming lazy. Runners are not lazy …..
Gels are not addictive like drugs !!! The are just a practical and fast way of refuelling. As said in the body of the text, other food will also serve the propose, like a banana. The gels are not drugs or boosters, it is a mix-conception to think that they provide some kind of enhancement for your performance, helping you to do better…. No, that’s not the case: the gels are not a substitute of the training, the remedy for lazy people.